Here’s the first full trailer for the French animated feature Le Petit Prince(The Little Prince) directed by Kung Fu Panda director Mark Osborne. The CGI film will be released on October 7, 2015 in France by Paramount Pictures. An American release date has not been set, but Paramount Vantage has already picked up the U.S. distribution rights. 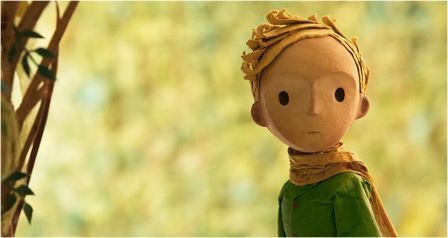 The $80 million film—is this the most expensive French animated feature of all-time?—is an adaptation of Antoine de Saint-Exupéry’s classic 1943 novella The Little Prince, but it also has a wrap-around story about a contemporary girl discovering the book through a reclusive elderly neighbor. Exupéry’s book is the most-translated French-language book of all time and has sold nearly 150 million copies worldwide. Director Orson Welles attempted unsuccessfully to adapt it into an animated feature with Hugh Harman and Mel Shaw in the 1940s. This new film was produced primarily by Mikros Image in Montreal, Canada, where Osborne himself has been headquartered.